How will the subprime crisis affect the Canadian economy? I don't really know, but that didn't stop me from accepting an invitation from the local Radio-Canada station to do a radio interview on the subject (in French). You can listen to it here. The shift of productive resources out of the manufacturing sector is of course the appropriate response to the relative price movements we've seen over the past five years, and the outcome has been generally positive. 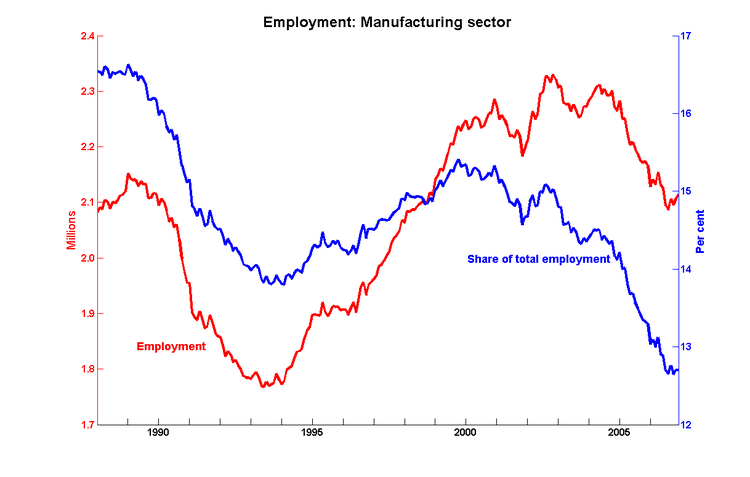 But there has always been the question of the loss of 300,000 manufacturing jobs. Put that way - "the loss of 300,000 manufacturing jobs" - one is left with the impression that there are 300,000 people out there whose lives have been turned upside down by forces beyond their control. Even if the economy as a whole has benefited from the structural changes we've undergone over the past five years, we should be trying to compensate those who have paid the transition costs. Employment rates are at an all-time high. For the first time in decades, real wages are increasing. There appear to be no significant increases in inequality. But there's still the question of the 300,000 fewer workers in the manufacturing sector: just how has that been accomplished? Stephen Tapp, a PhD candidate from Queen's University, has been investigating these employment shifts and he has some surprising answers (pdf). He has also been kind enough to provide me with some of the data behind his analysis, and they tell a story that flatly contradicts the standard narrative. When will the Marshall-Lerner condition kick in? The CAD appreciation hit a milestone in October, averaging above 1 USD for the first time in over thirty years. And the trade surplus went up. What's going on? In constant dollar terms, which isolates volume changes, volumes for imports rose 2.7% as prices declined 4.6%. Meanwhile, export volumes were up 1.9% and prices fell 2.4%. On a current dollar basis, lower prices contributed to overall reductions in the value of Canadian imports and exports. Imports declined 2.0% to $34.0 billion, while exports edged down 0.5% to $37.4 billion, the third consecutive monthly decrease. Nevertheless, for the first 10 months of 2007, both imports and exports were higher than for the same period in 2006: the movements in quantities were not enough to counter the changes in prices, especially for imports. In order for an exchange rate appreciation to reduce the nominal trade surplus, the Marshall-Lerner conditions have to hold: the sum of the demand elasticities for imports and exports has to be greater than one. It's reasonable to expect that the short-run elasticities will be not be large enough to satisfy these conditions, but they are generally believed to apply in the long run. So an exchange rate appreciation could have the effect of temporarily increasing a trade surplus before it came down - the J-curve. That's not happening - or at least, not yet. A partial explanation no doubt involves the shift towards exports of energy, whose demand appears to be pretty inelastic. But for how long? 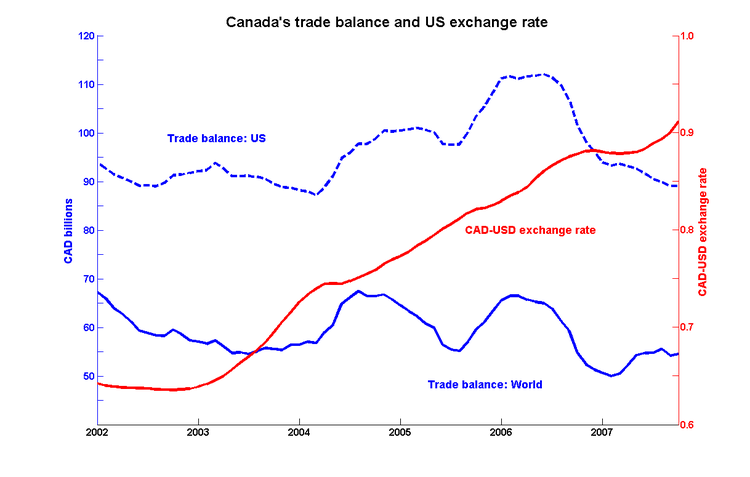 Economic train wreck in the U.S. would hit Canada, decoupled or not: After subprime, decoupling just might be the most overused word of the year in economics. A quick database search yields hundreds of newspaper stories about the decoupling phenomenon in the past three months alone. Here's the theory: Forget the notion that the global economy closely tracks the fortunes of the mighty United States, that voracious consumer of everything. The decoupling theory has even gained a few fans in Canada, who apparently believe that Alberta's oil will save us all. BMO Nesbitt Burns economist Douglas Porter argued in a recent report that it's "a myth that every time the U.S. sneezes, Canada catches a cold." He pointed out that four times since the sixties, Canada has stayed in the black while the U.S. sank into recession - 1970, 1974, 1980 and 2001. "Even if the U.S. economy does succumb to a full-fledged downturn, that does not necessarily mean that Canada will also automatically follow suit," Mr. Porter said. He pointed to looming tax cuts, the relatively healthy housing sector, less restrictive credit conditions and still-strong commodity prices as evidence Canada can hold back the tide. This sounds a bit like what I said here a couple of months ago. It's worth exploring a bit more in detail. Free trade? First, lower the barriers: To the dismay of some Canadian exporters, free-trade talks with South Korea have reached an impasse. But that shouldn't be the end of any smart free trader's world, given South Korea's refusal to lower its non-tariff barriers to automobile trade despite almost 2½ years of negotiations. The South Koreans won't even grant the same automotive concessions to Canada that they recently made to the United States, and the U.S. Congress is balking at approval of that free-trade treaty. The inequity is palpable. Canada currently imposes a tariff of 6.1 per cent on South Korean car imports, mainly vehicles from Hyundai Motor Co. and Kia Motors Corp. North American automotive manufacturers are afraid that the elimination of this duty could trigger a flood of small Korean cars that are not assembled here. But Korea has far greater barriers, including an 8-per-cent tariff on auto parts and most vehicles and a 25-per-cent tariff on some trucks. South Koreans face tax audits if they buy foreign cars. Korean licence plates are a different size from those elsewhere in the world, so foreign automotive companies must do a separate production run. South Korea applies a tax on automobiles based on engine-displacement size, which disproportionately affects larger foreign cars. It's little wonder that Canada's annual exports of automotive products to South Korea were worth only $11.5-million last year, while the value of Korean automotive exports to Canada was roughly $1.7-billion. There is much to be gained from a free-trade deal with South Korea, including the elimination of tariff and non-tariff barriers and the easing of restrictions on investment and services. A deal could open doors to other fast-growing economies in that region, if companies used Korea as a strategic base. Canada could snare major export gains in agriculture, fish, forestry, information technology and industrial equipment. After all, with GDP of more than $1-trillion, South Korea is the 12th-largest merchandise-trading nation in the world. No one wants the negotiators to give up. But while International Trade Minister David Emerson has said the talks have not irreparably broken down, he made it clear that Canada is "not going to rush into a deal." That is an appropriate stand to take. Canada should not sign a deal that allows South Korea to keep such punitive non-tariff barriers in place. Such trade is neither free nor fair. The reason why free trade is a good thing is that it allows us to buy things more cheaply than we can make them ourselves. A Canada-South Korea FTA should be evaluated on the basis of how it affects consumer welfare, not how it affects exports.